It’s been way to long since our last proper trip, one that you could really call traveling. It’s been more than 5 months to be exact – since our weekend getaway to Paris (which was a culinary rich experience as well – you can read about it here). 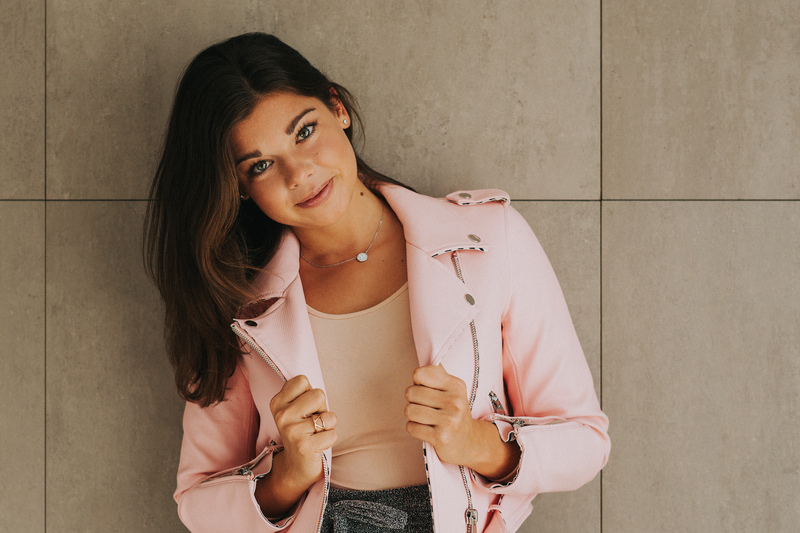 So you can imagine I’ve been really excited ever since we’ve decided that we’re taking a week off and doing a little Eurotrip to Budapest, Bratislava, Prague and Brno. That meant three new countries for me and three new (although quite similar) cuisines. Once the hotels were booked and the tourist attractions listed, all there needed to be done was to make a list of traditional foods in all the countries that we absolutely needed to try. As you can imagine, this was a task that I was more than willing to “tackle”. 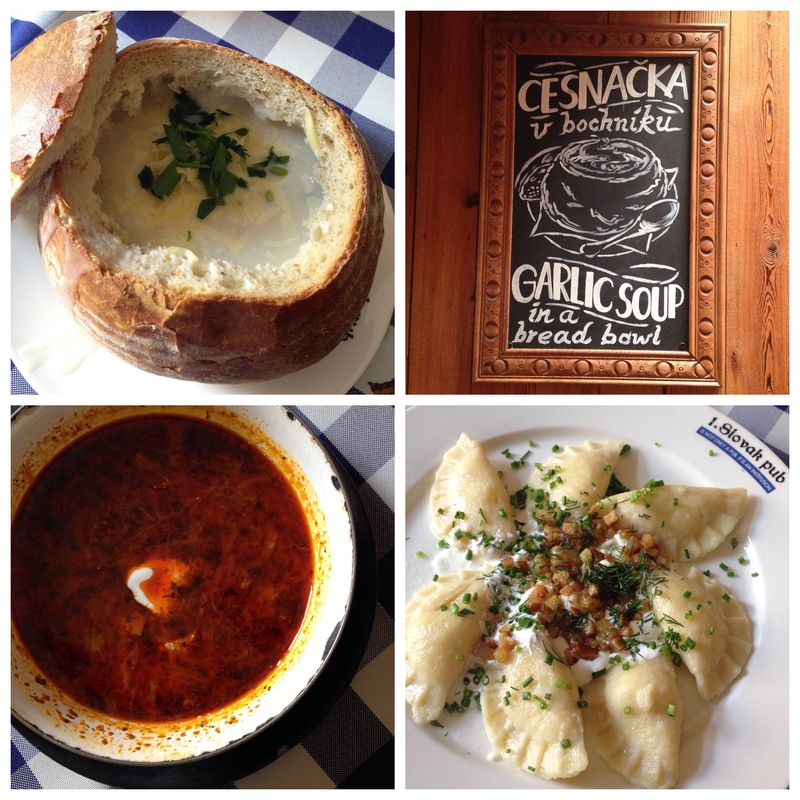 Probably the most typical soup in Hungary would be the Gulyásleves (goulash soup). It is a soup made of beef, vegetables, ground paprika and other spices which originates from a dish cooked by the cattlemen who tended their herds in the Great Hungarian Plain. The original dish called bográcsgulyás was a stew, not a soup. 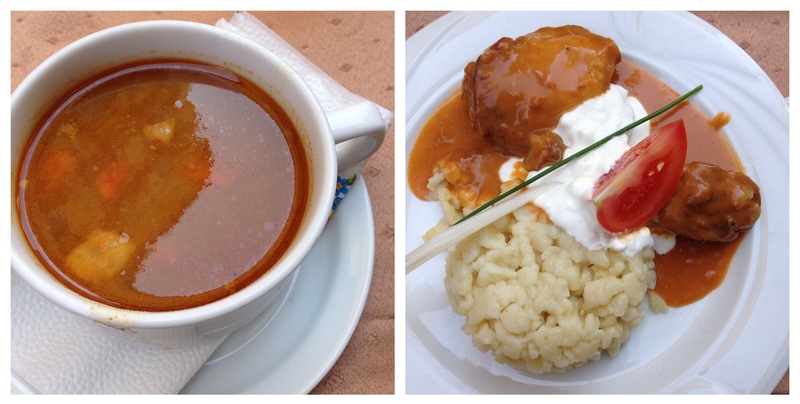 They still offer both options in most restaurants – a goulash soup as a warm appetizer or a goulash stew as a main dish, mostly served with galuska. There are different variations of the goulash soup recipe. The meat is usually beef and the added spices and veggies are tomatoes, carrots, fresh peppers and potatoes, while onions, paprika and caraway seeds are added for the specific flavor. Probably the most common Hungarian side dish are the Galuska, a kind of soft egg noodles or dumplings. 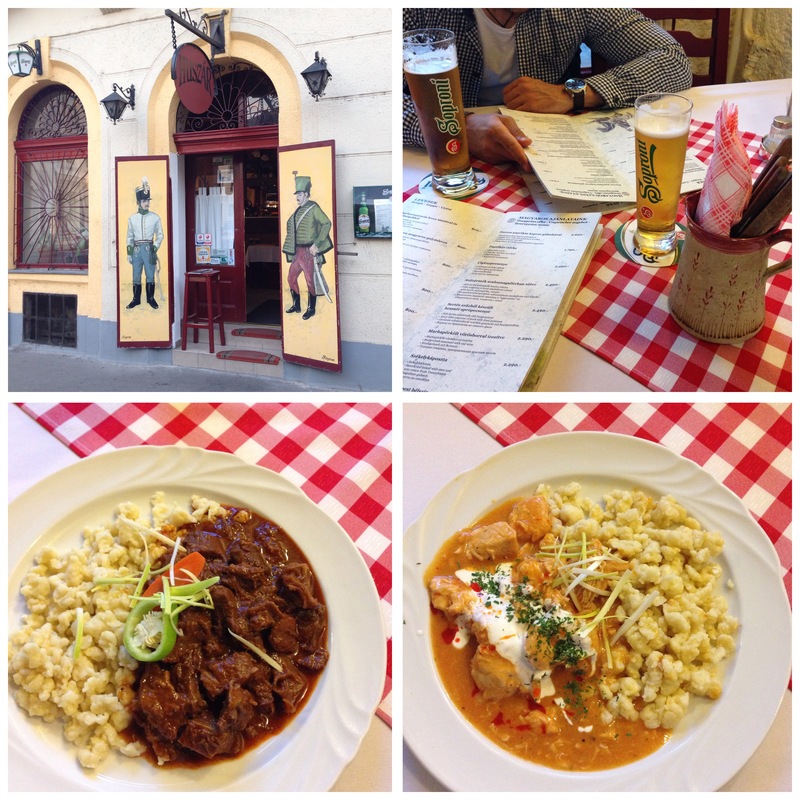 They are served with the two most traditional Hungarian dishes which are the chicken paprikash called Csirkepaprikás (a stew with chicken and a lot of sweet paprika and sour cream) and the Székelygulyás, which is the above mentioned stew variation of the goulash. We’ve tried the chicken paprikash in quite a few restaurants around Budapest (Huszar, Paprika and another one on the Vaci Utca of which the name I just can’t remember) but we agree that by far the best one we’ve ever had is the one made by my mom. 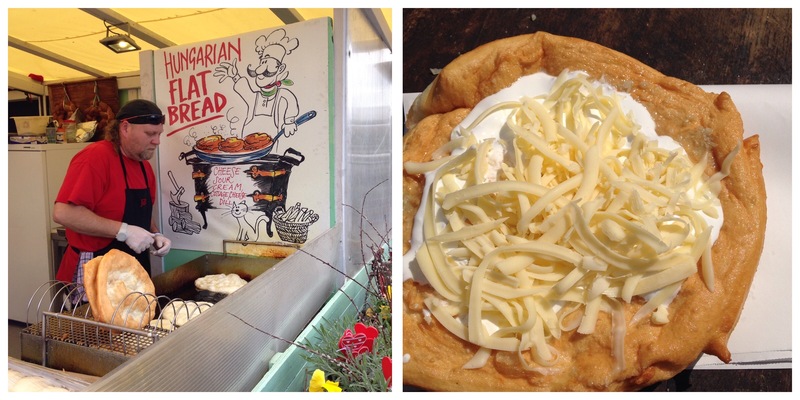 Hungary also offers a wide range of street food. It’s mostly not for those of you who are trying to watch your weight, though, since it’s often fried and/or full of cream and cheese. We ended up trying the Lángos, which is a fried bread dough, served either plain or covered with toppings of your choice, like garlic, sour cream, cheese and ham. 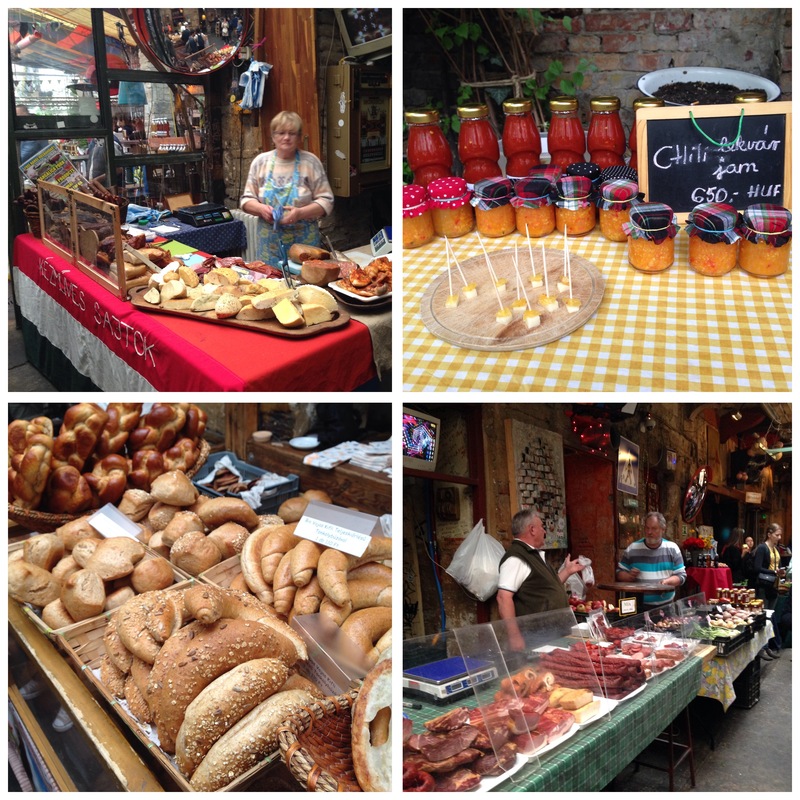 A must visit in Budapest is the Szimpla Kert, more specifically a Sunday Farmer’s market hosted by the Szimpla Kert every Sunday from 9 a.m. to 2 p.m. It’s a great source of healthy, farm-fresh, home-grown products and it’s the perfect place to sample some delicious homemade food in a cool and friendly atmosphere. 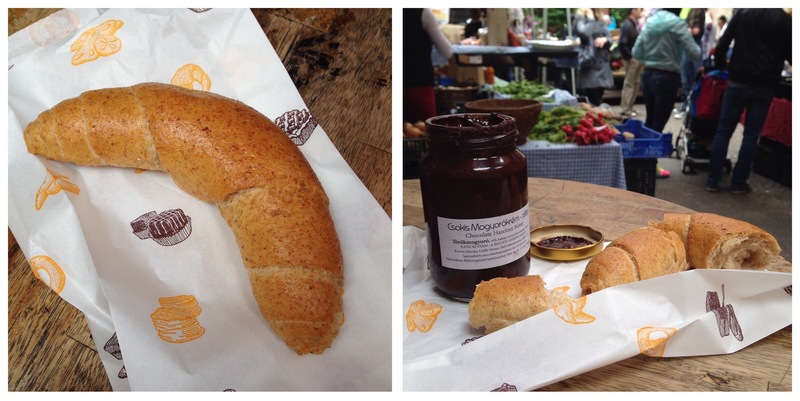 You can choose from all kinds of breads, cheeses, sausages, jams, fresh vegetables and so much more. Most of the stalls also offer small tasting bites of their offer so you can decide and choose your favorite. Our’s was definitely the sugar free homemade Nutella! Kifli are a crescent-shaped pastry sold in every bakery. They are more bread like and nothing like a croissant, but still go great with the homemade sugar free “Nutella” we’ve bought a few minutes before at the Szimpla Kert market. Our all time favorite of the trip must have been the Kürtőskalács (a name we still can’t pronounce) – a stove cake or chimney cake, cooked over an open fire. It is a Transylvanian specialty, famous as Hungary’s oldest pastry, and is simply a strip of dough wound and rolled around a cylinder, covered in sugar and baked over an open fire. Budapest offers many variations of toppings, including almonds, walnuts, cinnamon, vanilla, chocolate and coconut. Our favorite one? Almonds! 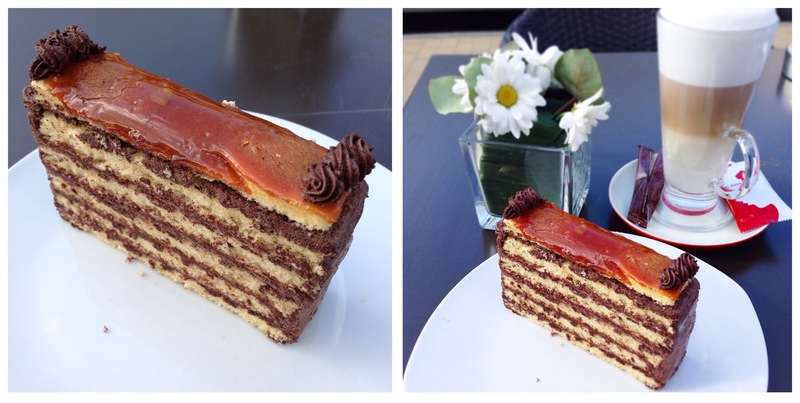 Dobos Cake is probably the most famous Hungarian cake and it is a sponge cake layered with chocolate paste and glazed with caramel and sometimes nuts. It was the first dessert that we tasted in Hungary (we couldn’t wait until we got to Budapest and so we got one from a little bakery in Siofok, a town at Balaton lake). 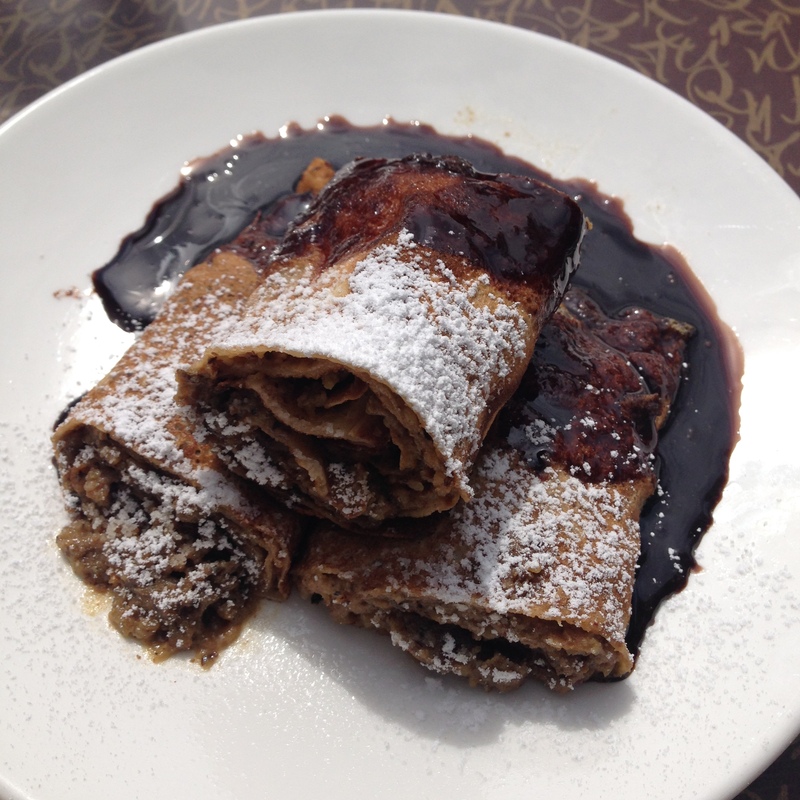 Another dessert on my must-try list was the Gundel palacsinta or the Gundel crepe, which is a crepe stuffed with walnuts and served in chocolate sauce, often also flambéed. It was actually a lot harder to find one that we thought (especially one that didn’t cost 8 EUR or more). We finally found it at the end of the famous Vaci Utca at the Anna Cafe. It is a delicious dessert but since it is stuffed with walnuts AND covered in chocolate, a small serving is more than enough for two people. A great way to have a taste of as many traditional desserts as possible without having to gain 20 pounds by eating whole pieces of cake, is to order a tasting plate. 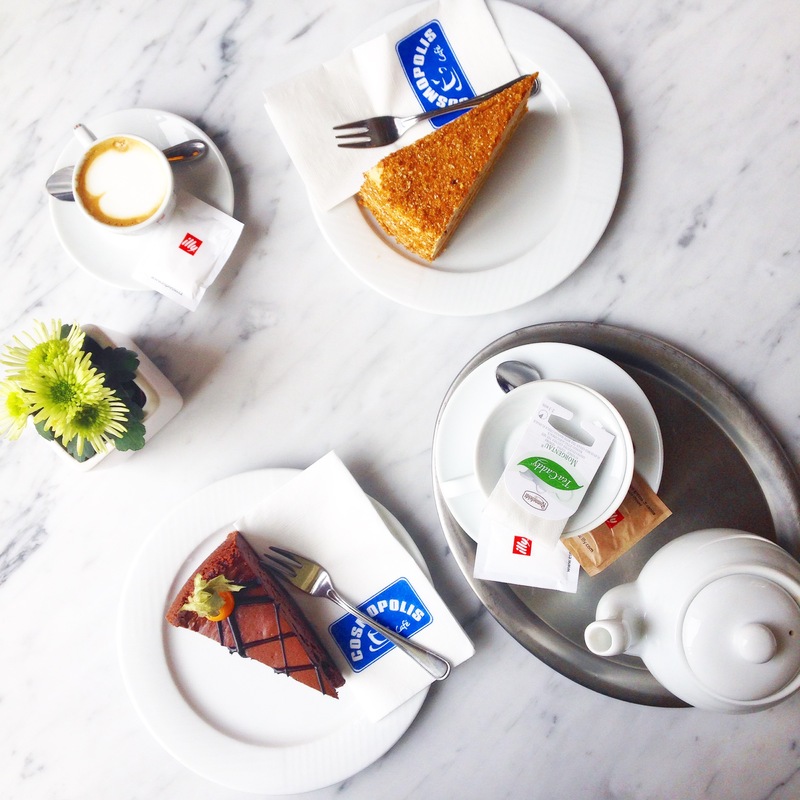 They offer it at many dessert shops around Budapest but the prices may vary quite a lot. In the end, we decided to go with the Gourmet selection at the Szamos Gourmet Ház which included the Eszterházy cake, which is a Hungarian cake (torta) named after Prince Paul III Anton Esterházy de Galántha (1786–1866), a member of the Esterházy dynasty and diplomat of the Austrian Empire. It was invented by Budapest confectioners in the late 19th century and soon became one of the most famous cakes in the lands of the Austro-Hungarian Monarchy. It consists of buttercream spiced with cognac or vanilla, sandwiched between four to five layers of almond meringue (macaroon) dough. The cake is iced with a fondant glaze and decorated with a characteristic chocolate striped pattern. It also included the Dobos torte already described above, Truffel morsels and Besci tallerral (Wiener dollar). Since the weather in Budapest was super sunny and warm, we decided to go for some ice cream. A quick look at the Foursquare app suggested Gelarto Rosa and we didn’t think twice before deciding to give it a try. If you decide for an ice cream to go and choose to have it served in a cone, they will serve it shaped like a really pretty rose (like you can see in the picture on the menu on the left side). But be prepared to wait in a really long queue! We rather decided to sit down at the table, which meant that we would be served the ice cream the “traditional” way, but that didn’t influence the flavor one bit. My hazelnut and panna cotta salted butter caramel were beyond delicious! One thing I’ve been wanting to try ever since I’ve seen it at the market in Budapest, was the garlic soup in a bread bowl. Since it seems to be even more traditional in Slovakia, we decided to give it a try in one of the most recommended pubs in Bratislava, the 1st Slovak Pub. It was a very delicious garlic soup (with no special secret recipe, though, I would assume) and it was fun having it from the bread bowl since you get to scoop some of the bread from the inside while eating the soup and you don’t have to dip a separate piece of bread in it. We also tried the kapustnica, which is a fairly sour soup made of sauerkraut (and apparently lots of oil). For the main course I went with the Bryndzové pirohy which are dumplings of unleavened dough – first boiled, at which point they can be served with melted butter or various toppings, in my case sour cream and roasted bacon, or then fried with onions – traditionally stuffed with potato filling, sauerkraut, ground meat, cheese, or fruit. After a long few days of walking and trying out the traditional eastern European dishes, we decided to spend the afternoon in a more “international” cafe. 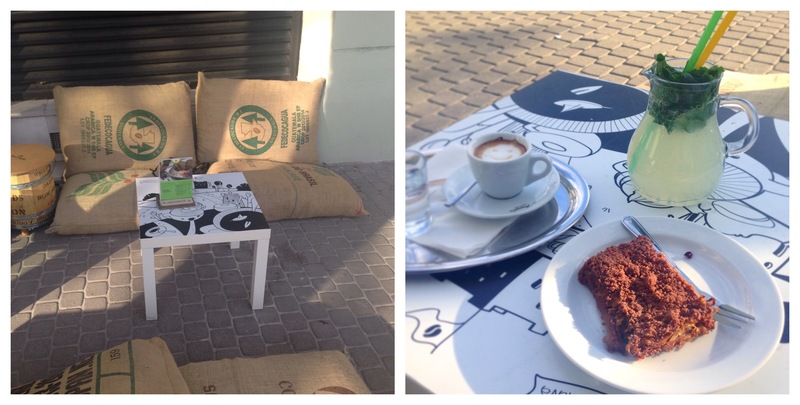 As soon as we saw these super cute coffee bags used instead of chairs in front of Moods, we had to sit down for a coffee and a refreshing drink. At least one person per table seemed to be drinking something that looked like a lemonade, so we decided to order it as well. It’s actually called citronada, and it consists of sparkling water, lemon juice and lots of fresh mint. 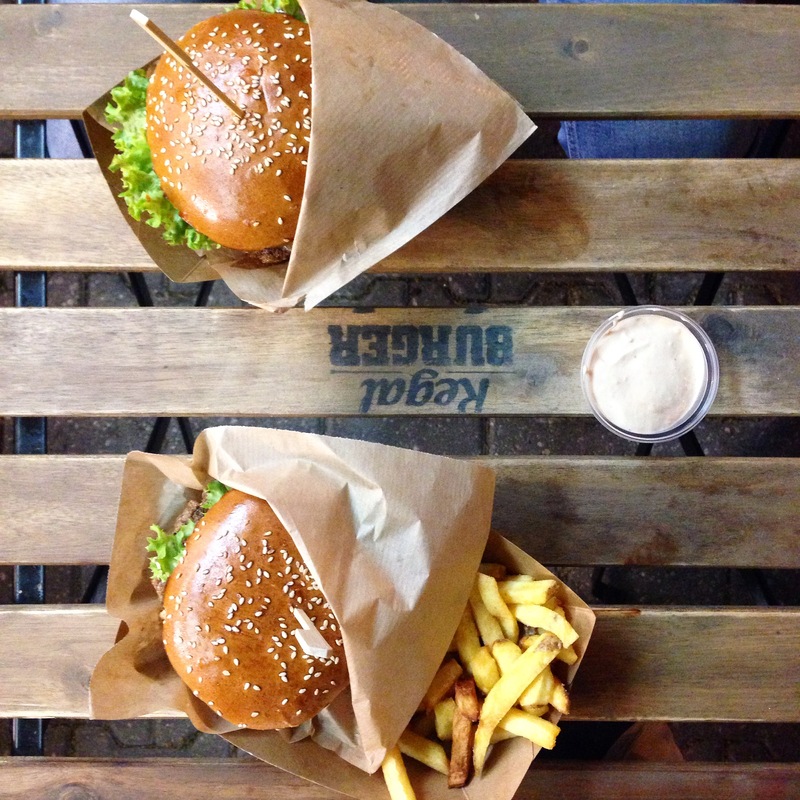 If you are not a fan of traditional Slovak food or if you just need a break from all the dumplings and soups, like we did that day, go for a burger at the Regal Burger in Bratislava. It’s quite expensive, especially for Slovakia, and you almost can’t call it fast food since you need to wait at least 10 minutes to get it, but it’s well worth the wait. The ingredients are fresh and homemade, the flavors are amazing and they also make their own french fries. The final must stop in Bratislava was the Koun gelateria. We wanted to visit it as soon as we got to Bratislava, but were unlucky enough to get there the only day of the week they were closed (Monday). We didn’t give up though, especially since it was said to be the best gelato in town. Carefully planning our trip further north to Prague, we made sure to make some time on Tuesday morning to stop by this cute little gelateria and taste some of their ice cream. They only make a few flavors each day so we couldn’t try their most recommended chocolate and pistachio, so we went with the walnut and amaretto. It was delicious but we can’t say it was the best ice cream we’ve ever had. In the Czech Republic it seems to be all about dumplings (knedlíky) as far as side dishes are concerned. They are steamed and sliced bread-like and are one of the mainstays of Czech cuisine, typically served with meals. They can be either wheat or potato based, and are sometimes made from a combination of wheat flour and dices made of stale bread or rolls. 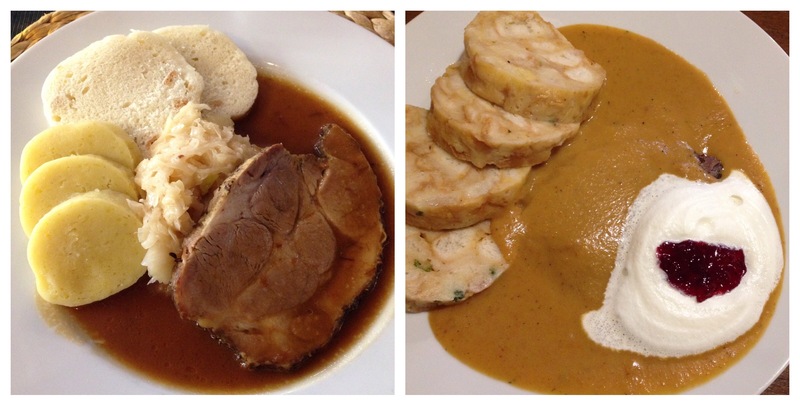 One of the most typical Czech dishes which is also served with the knedliky is the so-called vepřo-knedlo-zelo, which is roast pork with dumplings and cabbage, which is either cooked or served pickled. I tried mine at the Karlova 30 restaurant in Prague and it was really delicious, though I can’t say it’s much different from what we eat here in Slovenia. The other typical dish that can be found in almost any Czech restaurant is svíčková na smetaně, which is marinated sirloin in cream sauce (“na smetane”) of carrot, parsley root, celeriac and sometimes cream. This dish is also often served with knedlíky, along with some chantilly cream—sweet, whipped cream—cranberry compote (kompot) and a slice of lemon. This is actually just how we were served the dish at the Zelena kočka restaurant in Brno and I must say we liked it. 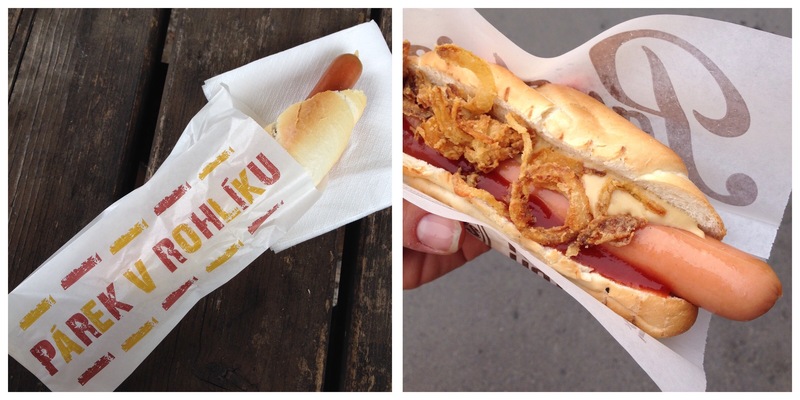 Czech cuisine also serves some good street food, the most famous of it being the Czech hot dog or párek v rohlíku, which consists of boiled or steamed sausage dipped in mustard or ketchup served in a roll with a hole made inside, not in a sliced bun like the common hot dog (picture on the left). You can also get a common hot dog with a sliced bun in Prague, the best definitely being at the Parky’s stand on Florenc bus station. 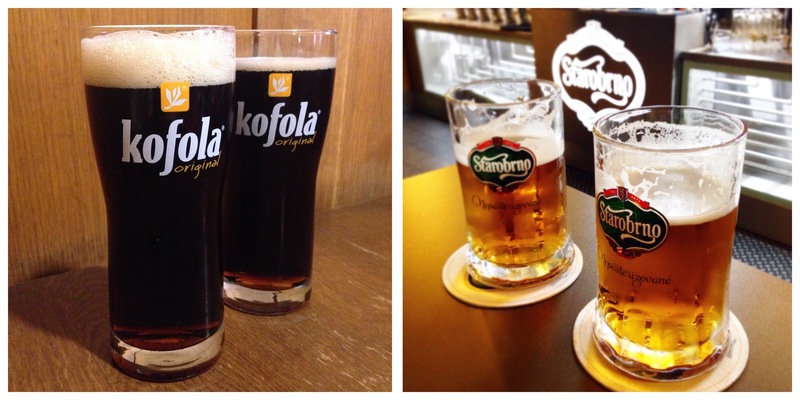 You can’t walk or drive around Czech Republic or Slovakia without seeing signs for Kofola everywhere. Naturally, we had to see what all the fuss was about and we learned that Kofola is a Czechoslovak carbonated soft drink produced in Czech Republic and Slovakia and is the principal rival of Coca-Cola and Pepsi in these two markets. The flavor is, in my opinion, quite far from Coca-Cola or Pepsi, since you can really taste a hint of lemon flavor. It’s good and refreshing, though, and also said to, in comparison to Coca-Coal and Pepsi, contain 30% less sugar, a little more caffeine and no phosphoric acid. The Czech are also well known for their beer. We decided to visit the Starobrno brewery in Brno, since it was raining at the time and it seemed like a good alternative to walking around the city sightseeing. And it sure was! We were given a private tour of the brewery with a nice old lady explaining the process of making beer from the four basic ingredients all the way to packaging, and above all that, the price of the ticket also included degustation of two of their beers. I must say it was a great experience even for a non-beerlover like myself. 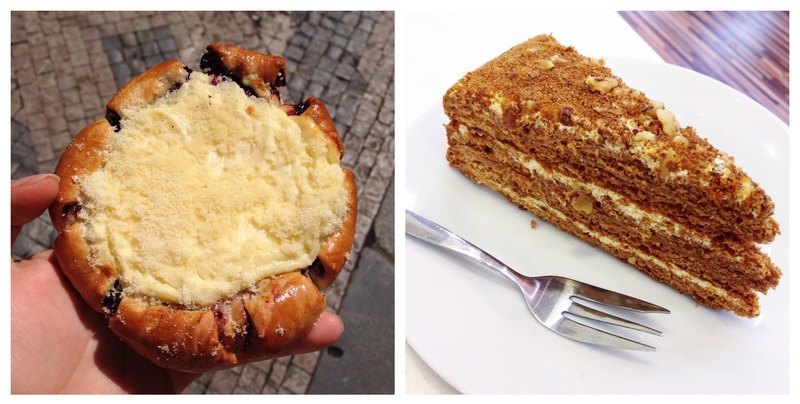 While you’re out and about, sightseeing around Prague, and you feel like having a little something sweet, stop by the nearest bakery and ask for Moravsky kolac. It’s s a type of mainly round yeast pastry consisting of fillings of fruits, curd, poppyseeds or doughnut. 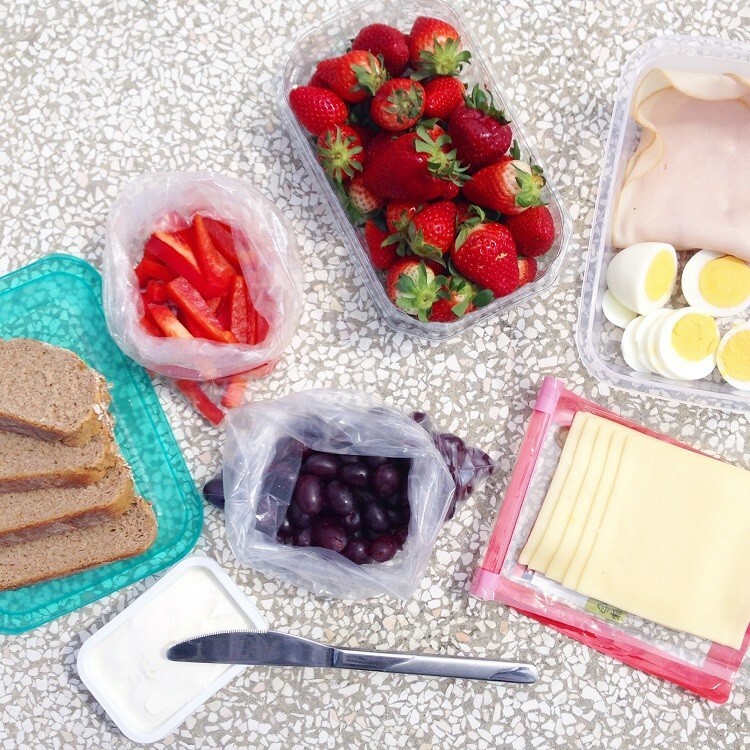 The one on the picture below is with cottage cheese and berries. Yum! A real must try while in Czech Republic is the Medovnik cake, a traditional Czech cake which according to traditional ancient Slavonic recipe is made from five separated sheets put together with cream. An English translation of the name would be honey cake, due to the fact that one of the main igredients in the cake is honey. 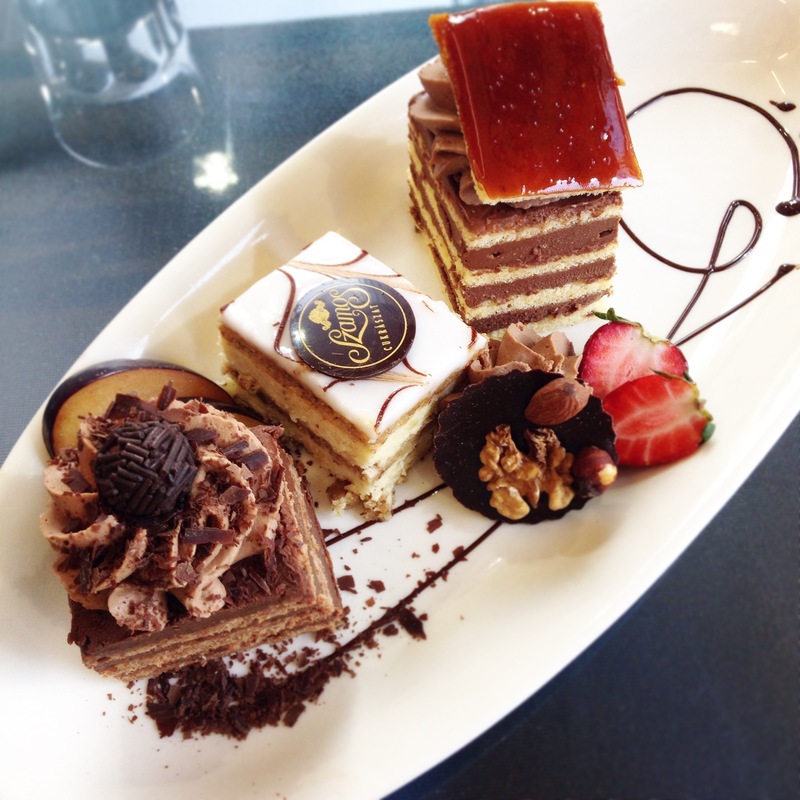 We’ve had ours at the Ovocny Svetozor and we can really highly recommend this place if you want to try the honey cake. Last but not least among the Czech desserts is the Trdelnik, which is a traditional cake baked on a rotating spit over open fire. It’s similar to the Hungarian Kürtőskalács, only (to our disappointment) smaller. 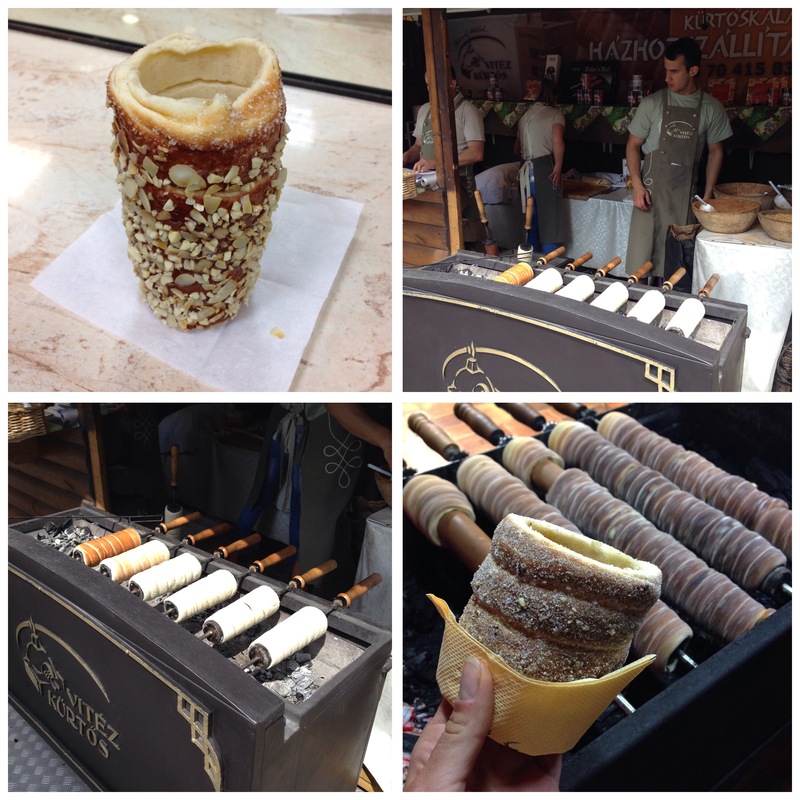 It is also very rare to see Trdelnik with a topping other that sugar. They do tend to offer ones covered in Nutella though, but I would not suggest having it, since it totally covers up the amazing flavor of the dough. 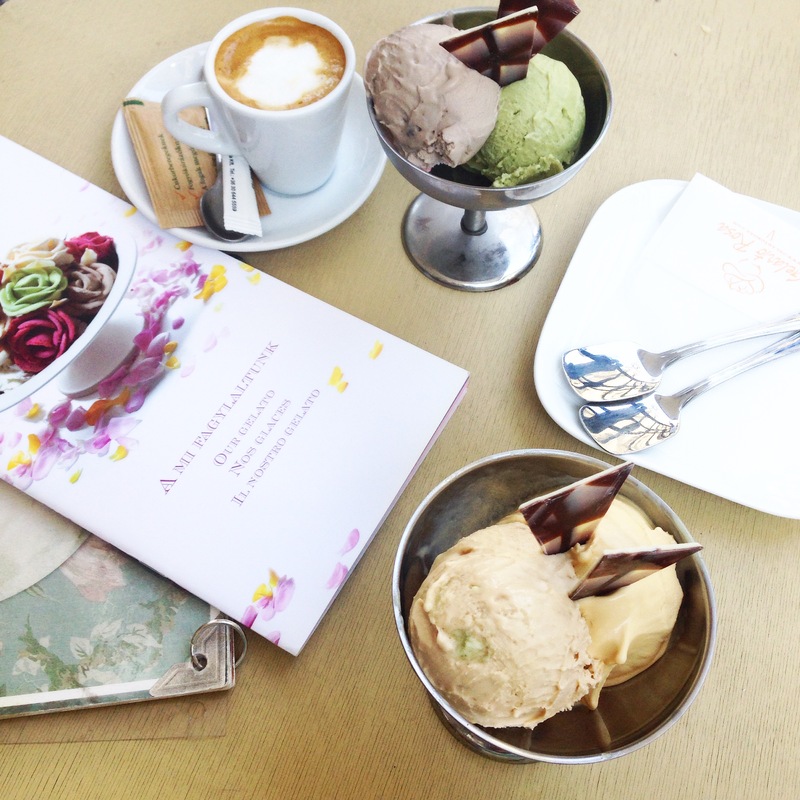 Since Brno was our final stop, we decided to give ourselves one last treat before returning to “reality”. 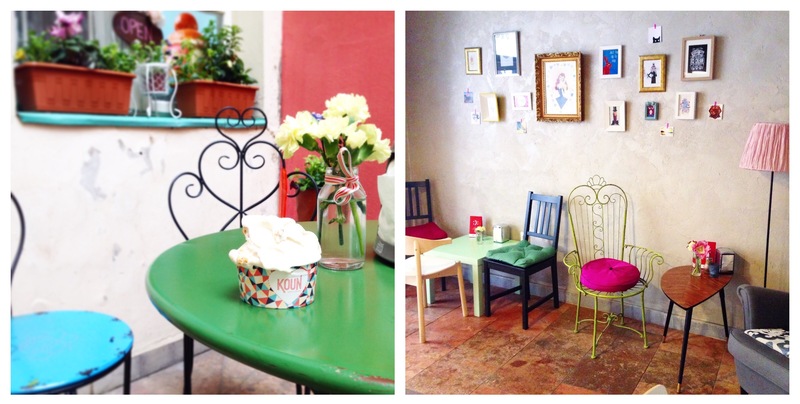 After close examination of all the dessert shops and cafes, we ended up choosing the Cosmopolis Café. We gave the Medovnik another try (it wasn’t as good as the one in Ovocny Svetozor, though) and also had a delicious choco cheesecake.